Prototype: German Federal Railroad (DB) standard design type Abi "Donnerbüchse" / "Thunderbox Car". 1st and 2nd class. Model: A cinnamon colored Steiff teddy bear is also included with the passenger car. The teddy bear passenger is made by hand of the finest mohair and has a separately attached head and legs. The bear wears a plaid shirt, a cap made of felt, and a backpack. Length of the car over the buffers 16.0 cm / 6-1/4. DC wheel set 2 x 700580. The teddy bear has a consecutively numbered ear tag and a gold anodized button in its ear. 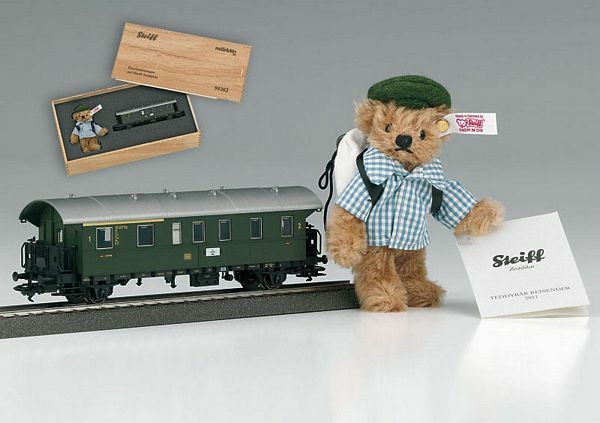 The car and the Steiff bear come packaged in a waxed wooden box with a wood-burned imprint.